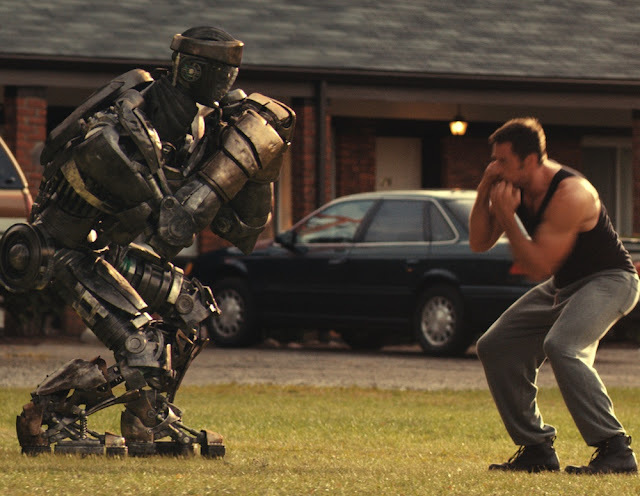 Real Steel, all the hype surrounding this movie is there for a reason, because it does come off as a really awesome movie. I got a chance to catch Real Steel tonight over at E-Curve thanks to Nuffnang. A couple of other bloggers have already caught another screening of the same movie last Saturday so I had a heads up that this movie was good. Heading into the cinema with really high expectations especially with Dreamworks, Steven Spielberg and Hugh Jackman being thrown into the picture, I am happy to say I wasn't disappointed at all. So what is this movie Real Steel all about? My first impression when first watching the trailer was that it would be a spoof of Transformer, I was wrong. Read on below. 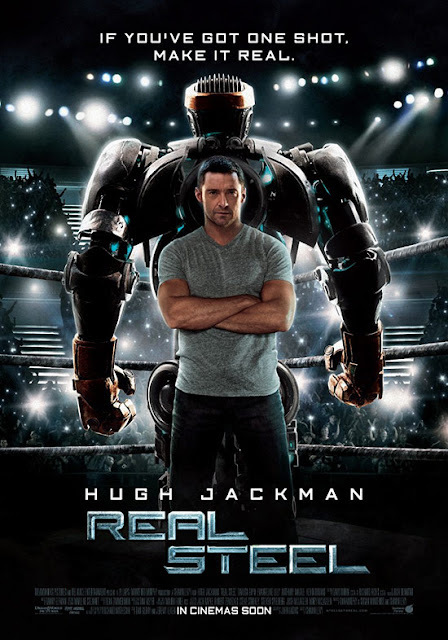 Set in the year 2020, the movie kicks off showing Charlie Kenton (Hugh Jackman) being this ex boxer who is in the twilight of his career in robot boxing. We see him making one bad move after another, losing all his money and robots through various misfortunes. That is, until his ex-wife passed away, leaving him with this really cool son, Max (Dakota Goyo) who brings back the shine into his life. Initially Charlie dreaded the idea of having to babysit the kid, but as time passes on, together they trained this really cool "sparring" robot, Atom to huge success. That's Bailey Tallet, Charlie's love interest in the movie. Bringing back Atom back to their gym, owned by Charlie's love interest Bailey Tallet (Evangeline Lily), we see an emotional bonding between father and son. Together with Atom, they scaled and win robot fighting matches, culminating in a finale against this really awesome and seemingly invincible super robot Zeus. Zeus holds an unbeaten record in the top robot fighting league, World Robot Boxing League (WRB), so naturally the finale has a setting of a David versus Goliath scenario. It's a nail fighting finale and you just have to catch this movie to see how it ends. The action is furious, with scenes of relentless steel smashing together as we see robots fighting to destroy each other in arenas. Real Steel really develops the main characters up to the extend we could all relate to them and feel all the emotions the characters are feeling. We get to go through emotions of faith, sadness, hope and happiness as we follow the development of the story. Real Steel is definately a must watch for this month. Do catch it should you get a chance. I rate this a high 8/10 so you get a pretty good idea of how awesome this movie is. I leave you with the trailer from Real Steel below. "In April 2011, DreamWorks announced it was developing a sequel to Real Steel. John Gatins, who contributed to the screenplay for the first film, was hired to write the screenplay for the second. Director Shawn Levy said in September 2011 a sequel depended on the success of the first film and that he would also direct it. 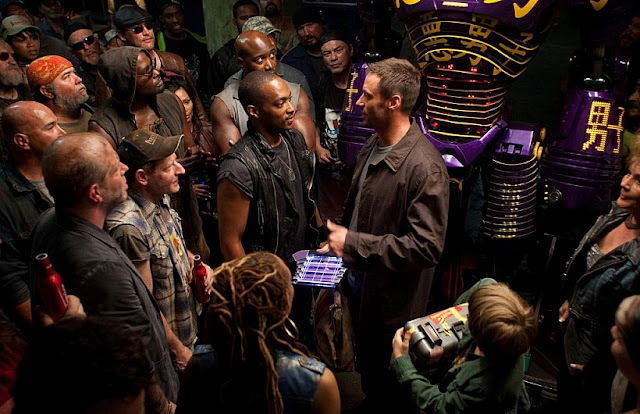 The key actors—Jackman, Lilly, and Goyo—would reprise their roles if the studio proceeded with a sequel, though the production schedule would need to match Jackman's crowded schedule"
" Real Steel really develops the main characters up to the extend we could all relate to them and feel all the emotions the characters are feeling. We get to go through emotions of faith, sadness, hope and happiness as we follow the development of the story." I agree too! :P lol! Btw, you really look so much more different from the last time I saw you. You're taller and more leng lui d. Luckily it was you with Andrew, if it's other chicks with him I will piak him. lol! Ho ho ho.. So,when will si Aki gonna watch this.. quite interesting..And now,will go and finish em all.. argh,fan of robot!! ^_^.v.. I ADOOOORE Hugh Jackman and I'm almost always pleased with his film.. even Wolverine.. which I know a lot of people seemed to hate. But I enjoyed it a lot. LOL! Never seen Hugh Jackman in any of his movies...but I've seen him on youtube videos...in the musical: The Boy from Oz... Nice! Love the songs! the storyline is interesting..must watch it! Real Steel steal the show..